As the name already suggest it, Gold Factory has an industrial cartoonish theme, where the action tooks place in a factory that makes gold! 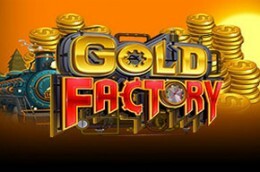 Gold Factory is a 5-reels and 50 paylines video slot brought to you by Microgaming software provider. All the symbols are theme-related and they include a hot air balloon, a submarine and a train. The wild symbol is represented by the Gold Factory logo. The big jackpot is worth 619.000 coins.